Deepika Padukone or Beyonce: Who rocked in Ashi Studio outfit? Home / Entertainment / Bollywood / Deepika Padukone or Beyonce: Who rocked in Ashi Studio outfit? And recently to give a hit to the outfit, global icon Beyonce donned the same outfit as Deepika’s. Fashion face-offs have been a norm in the entertainment industry for some time now, and with each celebrity trying to stand out with their unique dress and apparel, the end result is mostly a creation of almost similar looking outfits. The latest fashion showdown happened recently when contemporaries Deepika Padukone and Beyonce donned the same outfit. 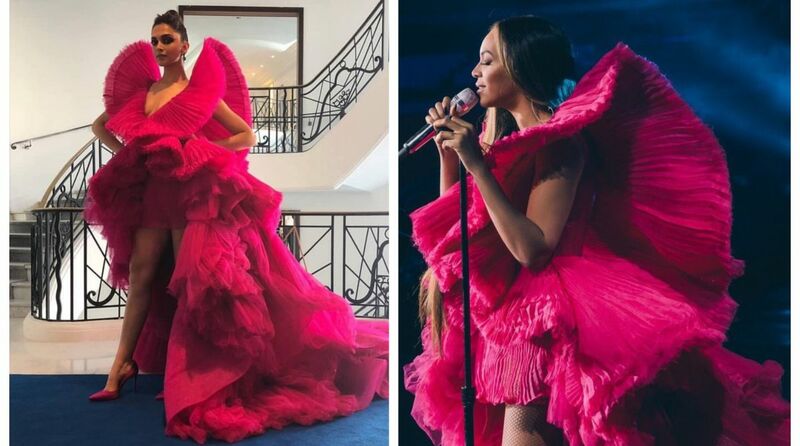 Bollywood diva Deepika Padukone stepped out of her comfort zone in a pink Ashi Studio gown at the Cannes Film Festival in May 2018. Deepika’s outfit featured heavy ruffles, avant-garde sleeves, and an exaggerated matching long train. To round off her look, she completed it with heavy smokey eyes, small drop earrings, and a bun. And recently to give a hit to the outfit, global icon Beyonce donned the same outfit as Deepika’s. Though Beyonce styled the pink high-low outfit with curly open hair, silver studded hoops, and silver heels at the Global Citizen event in South Africa. This year, Bollywood star Deepika Padukone made many fashion statements, the most recent being her wedding and she shared with us major bridal goals with her fashion mantra. On the professional front, the actress is gearing up to start shooting for Meghna Gulzar’s yet to be titled film. While we are not passing any verdicts between Deepika and Beyonce, you guys take your pick.